The web site project for CryptoMedix LLC has been evolving for a year, and still a work in progress, slated to launch mid-2018. I was recommended by a colleague in the Biotech industry and was hired to design, complete, and maintain the site from the ground up. I recommended WordPress as the development platform and CMS. 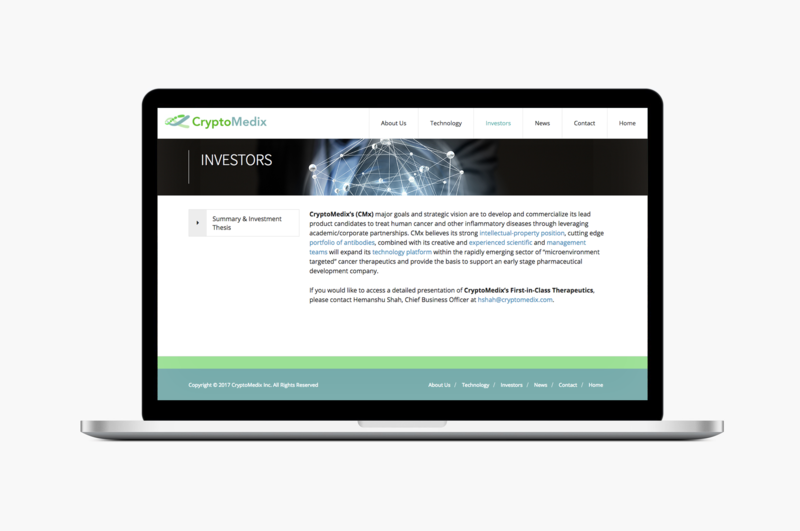 CryptoMedix LLC is a biotechnology company that engages in the discovery, clinical development, and commercialization of a portfolio of therapeutic biologics and diagnostic agents for cancer and certain inflammatory diseases.